Description - Our most popular pet-friendly turf, Pet Turf, is now available in easy to order, free shipping pre-cut rolls. 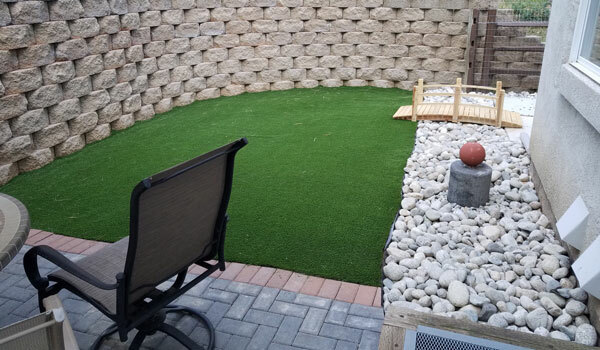 These artificial grass rolls are the perfect turf option for anyone who has pets and are non-abrasive, non-absorbent, and has one of our highest drainage rates. This paw friendly fake grass is great for both commercial and residential use and is backed by a 15-year warranty. Size – Our Pre-Cut Pet Turf Rolls are available in the following sizes 7.5' x 6', 7.5' x 10', 7.5' x 15', and 7.5' x 20'. Recommended Uses – Pre-Cut Pet artificial grass for pets is perfect for any outdoor or indoor application and can be found used as landscape turf, doggy day care turf and much more. I want to put this down on dirt for my dogs. Do I need to put some type of material down first? With the drainage hole should I expect to have mud come up thru the holes if it rains? If you are going to lay our Pet Turf Rolls down on dirt, we would recommend placing a weed barrier under the turf to keep any grass or weeds from growing under the turf. Mud will not come up through the perforations; water will flow through the turf and into the ground. I want to use this on my deck so my dogs can feel like they are in the grass. Is that possible and how do I secure it? Our Pre-Cut Turf Rolls are perfect for this application. The smaller mat sizes were picked for this purpose and will look and feel like real grass on your deck. To install our Pet Turf on a deck, you can either loose lay it, use double-sided tape, or you can glue it down. Typically people will just loose lay the turf so that they can clean under it periodically. I have received the sample I requested and like what I see. I am looking at covering a rectangular area for dogs approximately 14 X 60 feet. Do you have a recommended source for the staples or tape for joining the seams? Which is better for longer life? Also, I plan on using about 4 inches of compacted decomposed granite under the weed barrier for improved drainage. Any issues with that? You can purchase the seam tape and staples through us for your install of our Pet Turf Rolls. The staples would be the easiest and the preferred way to seam out turf rolls. In regards to the compacted decomposed granite, you can use as much of that product as needed to create a flat hard surface for your turf to be installed over. Can I lay over existing weedy lawn or do I have to remove? Also, I need to follow an uneven shape so how do you cut it to fit? 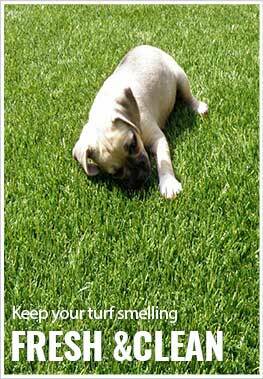 You can install our Pet Turf Rolls over a weedy lawn, but we recommend removing the existing grass when installing out turf. This will help to properly seam the turf and also will give you the best look. To cut our artificial grass rolls, we recommend flipping the turf over in the area where you need to cut and cut the turf, backing side up, with a sharp utility knife. How often do you fasten the turf down with the nails? Also, how do you keep the nails from loosening and having one of your animals accidentally walking on them? When installing our Pet Turf Rolls, we recommend placing nails every 6 inches around the perimeter of the roll. The nails are driven into the turf and dirt and will essentially be hidden from sight by the turf blades. You won't have any issues with animals trying to loosen them or you accidentally walking on them. We used it for patching around our pond and pool area, where we wanted green and weed free look It also protects the pool and pond from kids tracking dirt into it. Looks and works great! Still to soon, but looks great, dogs like it, I like it, will recommend later after a few weeks of use. I am loving the turf. The dogs love to play and lie on it. We landscaped our backyard. Here is a picture.